A Flight Attendant Resume for Professionals That Want to Aim High! 10 REASONS TO HAVE A FLIGHT ATTENDANT RESUME. Every day, aspiring flight attendants ask me to describe some of the benefits of having a flight attendant resume for flight attendant training and/or flight service. I've outlined below what I think are ten of the most appealing aspects of the profession. Feel a sense of pride and accomplishment (especially when you help an unaccompanied minor or handicapped passenger safely reach their destination (now, aren't those great benefits well worth putting together a seriously sensational flight attendant resume). Stephanie Shaw is a flight attendant with over 23 years experience with a major airline and a staff writer for AirlineCareer.com. Her Flight Attendant Resume is quite impressive! OBJECTIVE: Seeking Senior Staff position as a Flight Attendant with Virgin Airlines. Hopeful for promotion as Sir Richard Branson's V.I.P. Chief Steward. • Assisted passengers in placing carry-on luggage in overhead, garment, and under-seat storage. • Took inventory of headsets, alcoholic beverages, and money collected. • Announced flight delays and descent preparations. • Heated and served prepared foods. • Greeted passengers boarding aircraft and directed them to assigned seats. • Prepared passengers and aircraft for landing, following procedures. • Directed and assisted passengers in the event of an emergency, such as directing passengers to evacuate a plane following an emergency landing. • Walked aisles of planes to verify that passengers had complied with federal regulations prior to take-offs and landings. • Administered first aid to passengers in distress. • Answered passengers' questions about flights, aircraft, weather, travel routes and services, arrival times, and schedules. • Attended pre-flight briefings concerning weather, altitudes, routes, emergency procedures, crew coordination, lengths of flights, food and beverage services offered, and numbers of passengers. • Checked to ensure that food, beverages, blankets, reading material, emergency equipment, and other supplies were aboard and were in adequate supply. • Conducted periodic trips through the cabin to ensure passenger comfort, and to distribute reading material, headphones, pillows, playing cards, and blankets. • Determined special assistance needs of passengers such as small children, the elderly and disabled persons. • Verified that first aid kits and other emergency equipment, including fire extinguishers and oxygen bottles, were in working order. • Announced and demonstrated safety and emergency procedures such as the use of oxygen masks, seat belts, and life jackets. • Inspected and cleaned cabins, checking for any problems and making sure that cabins were in order. • Reassured passengers when situations such as turbulence were encountered. • Prepared reports showing places of departure and destination, passenger ticket numbers, meal and beverage inventories, the conditions of cabin equipment, and any problems encountered by passengers. • Assisted passengers while entering and disembarking the aircraft. • Inspected passenger tickets to verify information and to obtain destination information. Flight Attendant Resume prepared with (c) WinWay Resume Deluxe v.12 ; Absolutely the Most Incredible Resume-Writing Software Program on the Planet! The (c)WinWay Resume Deluxe v.12 Resume Wizard creates your resume in seconds. Simply choose a profession and fill-in the blanks. Don't start your resume from scratch. Enter the job title and let the new Resume Wizard find the closest matches from over 14,000 resume examples. Go through the wizard steps and fill-in the blanks. Watch your resume coming to life in front of your very eyes. Customize your resume further by adding specific information about your experience and skills. (c)WinWay Resume Deluxe v.12 writes your flight attendant resume & letters automatically...also auditing them for errors. 14,000+ examples included! The(c)WinWay Resume Deluxe v.12Letter AutoWriter® writes persuasive cover letters automatically! 400+ letter examples included! The(c)WinWay Resume Deluxe v.12 Letter AutoWriter® writes persuasive cover letters automatically! 400+ letter examples included! 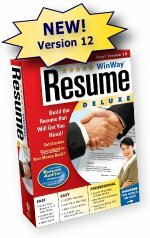 The(c)WinWay Resume Deluxe v.12 comes with a 90-day money-back guarantee. I can relate. But you do not want sympathy; you want advice. The best advice I can give you is to relax. You do not have to figure out the rest of your life in the next six months. I joined the "real world" just over a year ago, after four unfocused years of college. The flexibility of my psychology major allowed me to explore my many interests, from Latin-American music to the social constructions of health. I studied abroad for a year, wrote for the college newspaper and conducted HIV education programs. In my senior year, I was confused. I did not know what to do following graduation -- which of those diverse paths to pursue. My senior year I took the minimum course load (12 hours in the Fall and an awesome 8 hours in the Spring) in order to devote most of my time and energy to the job search. I spent most of those days in the library, glued to a computer screen, combing through every imaginable online job listing. There were jobs I wanted that I never could have gotten and jobs I could have gotten but never wanted. Graduation day loomed, and I was freaking out. All was not lost, though. I had two very real possibilities. The Peace Corps was a definite interest. I could experience some far-away place and contribute to the betterment of the world. The other idea emerged from my closet obsession with air travel, which I finally managed to do something about. Along with the Peace Corps, I applied for a flight attendant position. I know…It seems strange to mention being a Peace Corps volunteer and a flight attendant in the same breath. But both captured my overwhelming love of travel. It was not an easy decision, but in the end, I decided to put the Peace Corps on hold and take the job as a flight attendant. It was time to have some fun and fulfill an old dream. For more information on a flight attendant career, visit AirlineCareer.com. You would not be reading this article if you weren’t at least mildly interested in an airline career. But how do you know if it is right for you? I have friends who often get frustrated with their 9 to 5 office jobs and toss around the idea of joining me. After we get past the benefits (which are fantastic) and get into the actual work, their interest sometimes waivers. It is a demanding job, and it takes more than a "people person" to solve crises - both large and small - in such tight quarters and with very limited resources. You must possess good self-esteem and the sense not to take everything to heart cranky passengers and crewmembers throw at you. You have to be able to work strange hours, including nights, weekends and holidays. But of course, there are many advantages: you do not have to go to work every weekday from 9 to 5, you typically get more time off than at a typical job, and you very rarely see any kind of a supervisor or boss. Plus, working holidays may mean having a hotel room in Times Square on New Year’s Eve! Landing A Flight Attendant Job Is VERY Difficult!!! Landing a job at one of the major airlines is very tricky since the number of applicants far outweighs the number of positions (even with an awesome flight attendant resume ). There is good news though: most airlines are growing and hiring more flight attendants than ever. And a college degree does carry weight. While no carrier (that I know of) requires an applicant to have a degree, many of the flight attendants I know have undergraduate degrees. A few have even pursued advanced degrees while continuing to fly. A College degree Always looks good on a flight attendant resume plus application. Some airlines actually recruit on campus, though many conduct open interview sessions around the country. Consider applying if you’ve harbored that steward/ess dream since your first plane ride, or if the job sounds fun and you do not know what else you’d like to do. Have a great flight attendant resume handy. If you are headed to grad school but want a break or need to save some money, think about deferring. Airlines do not require minimum commitments; you can fly for a month, a year, or 30 years. If you only want to fly temporarily or decide it is not for you, no problem. You are not locked in. JFK-based JetBlue even designed a limited one-year program with recent grads in mind. As I mentioned earlier, competition for these jobs is intense, and I recommend checking out AirlineCareer.com's online resource (forgive me for sounding like an advertisement). This will give you the best opportunity to get hired. Of course, you could just wing it, but I can almost guarantee you won't get hired without some assistance. WHY IT'S ALL WORTH IT??? The benefits that come with an airline job cannot be beat, especially for those of us just starting to make our way in the world. Considering the work involved, the pay is decent. But it is the free travel that lures many into the industry. No matter how long you’ve worked for an airline, it is undeniably cool to be able to hop on a plane and go anywhere on a day off. This past year alone, I spent Thanksgiving in London (England) and New Year’s in Frankfurt (Germany). For fun, I vacationed in (Bangkok) Thailand.